People on the Internet love them some Jetstreams. That much is obvious even to the casual observer. I quickly fell in love myself, but alas, it ended up being one of those love affairs that burns brightly, briefly, and then flames out. 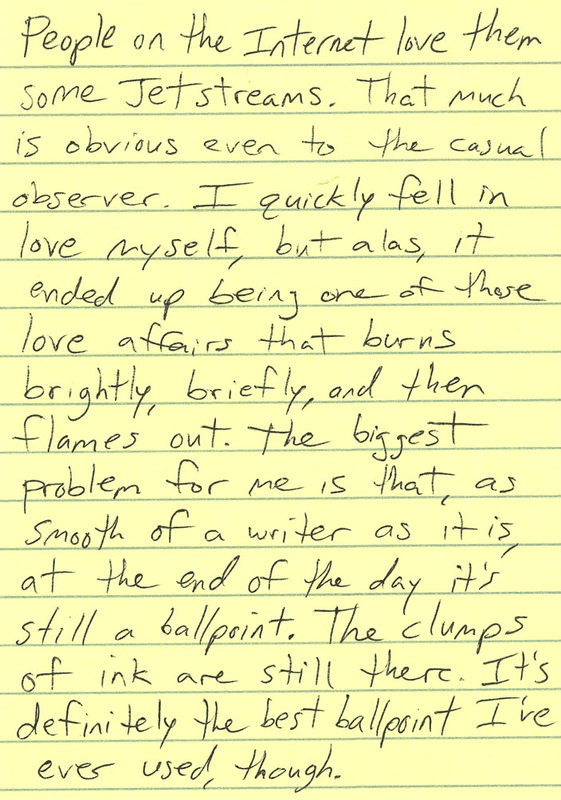 The biggest problem for me is that, as smooth of a writer as it is, at the end of the day it’s still a ballpoint. The clumps of ink are still there. 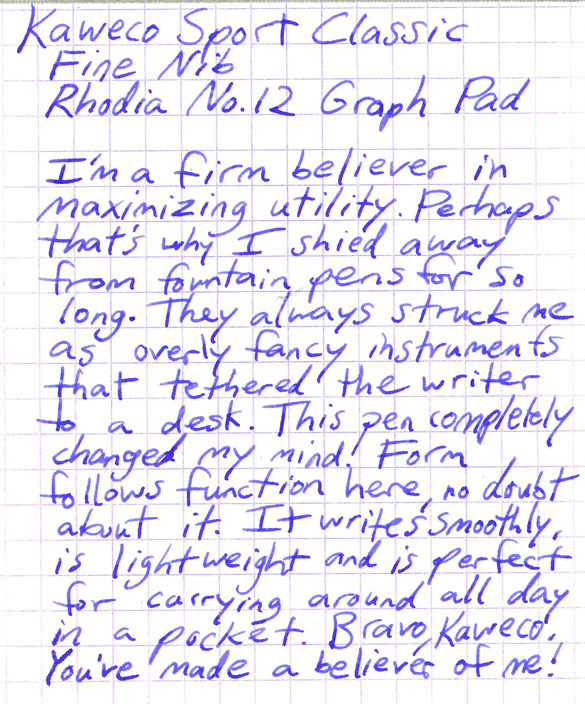 It’s definitely the best ballpoint I’ve ever used, though. JetPens provided me with a sample of the Japanese version of this pen, but for all intents and purposes, it’s identical to the American Jetstream Sport in 0.7mm (save for a single “racing stripe” near the top that’s missing on the Japanese version). I should point out that this is the older body style with three ovals on the clip, and the clip is the same color as the rest of the body. The newer body style tapers to a “pinch” just above the grip, and the grip itself appears to be slimmer and curvier. I’ve never used it so I can’t say which is better, but if you prefer the older style it seems you had better buy in bulk immediately. The pen feels good in the hand and is an unquestionably smooth writer, a fact on which Uni-Ball’s marketing department has capitalized in a YouTube video featuring one “Doctor Uni-Ball.” At first, I loved it so much that I purchased a box of a dozen just so I could share them with friends and coworkers. 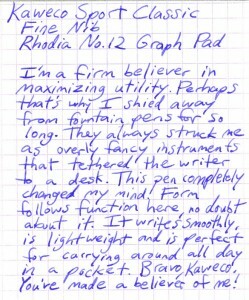 Perhaps I was caught up in the effusive praise that every Internet review seems to lavish upon this pen. And in fairness, as I’ve already stated, I would still choose this pen over any other ballpoint within reach, be they hybrid or conventional (although I have yet to try the Pilot Acroball). The problem is that the ink still tends to clump up occasionally, though not nearly as frequently as with conventional ballpoints. I also don’t see the consistent lines that I typically get from gel pens. There’s plenty of evidence in my writing sample for this review. Maybe it’s because I was also trying out a variety of other pen and ink types for the first time while I was getting acquainted with the Jetstream Sport. But after a brief period of infatuation, it seems to have gotten lost in the crowd. I can’t see grabbing this pen when it’s on the desk next to a Pentel EnerGel, for example. The latter would win almost every time. Their price points are very similar, especially now with the EnerGel-X line. The Jetstream is starting to look a bit less attractive lately, but I’ll always look back fondly on our time together. …I definitely prefer the aesthetics of the B2P to those of the standard G2, but that may be simply because the G2 hasn’t had an update in eons, and I’m just sick of looking at it. (Enough with that gross, rusty-looking area near the top of the refill!) The biggest design differences in my opinion are that the B2P barrel is a little wider, and the “grip” is simply some indentations cut in the plastic. The eco aspect (89% recycled content) is a nice touch, and the price differential is actually insignificant enough that it’s easy to justify choosing the B2P over the G2. That was an important business decision by Pilot, because as the premium prices of hybrid vehicles have shown us, sometimes the upfront cost of going green can be hard to swallow. At the end of the day, it’s still a G2 at heart. That can be a good or a bad thing, depending on your writing habits and personal preferences. While I may be a tad biased, I will share a story that I hope proves the degree of objectivity with which I approached this review. 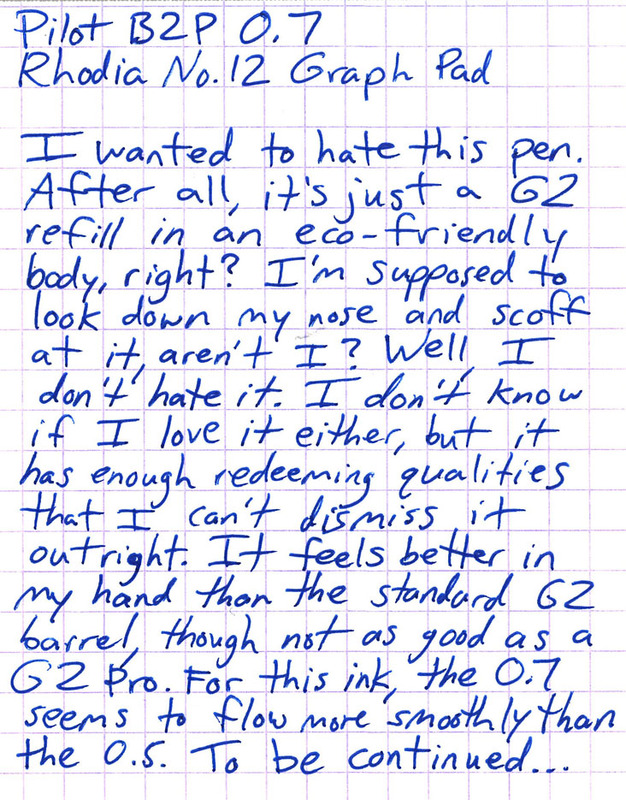 I put the B2P up against the three other pens that JetPens recently sent me for review, and let a small group of my work colleagues evaluate them with no pretext whatsoever. This is a group of people with diverse tastes in writing implements, and every single one of them independently chose the B2P as the winner. Take that as you will, but it certainly speaks to the broad mass-market appeal of this pen. I’m a firm believer in maximizing utility. 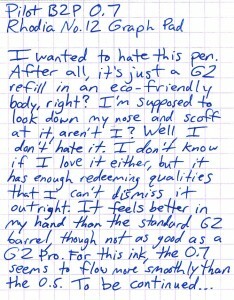 Perhaps that’s why I shied away from fountain pens for so long. They always struck me as overly fancy instruments that tethered the writer to a desk. This pen completely changed my mind! Form follows function here, no doubt about it. It writes smoothly, is lightweight and is perfect for carrying around all day in a pocket. Bravo, Kaweco. You’ve made a believer of me! There must be something I’m missing when it comes to Micro Tip Gel Ink pens. 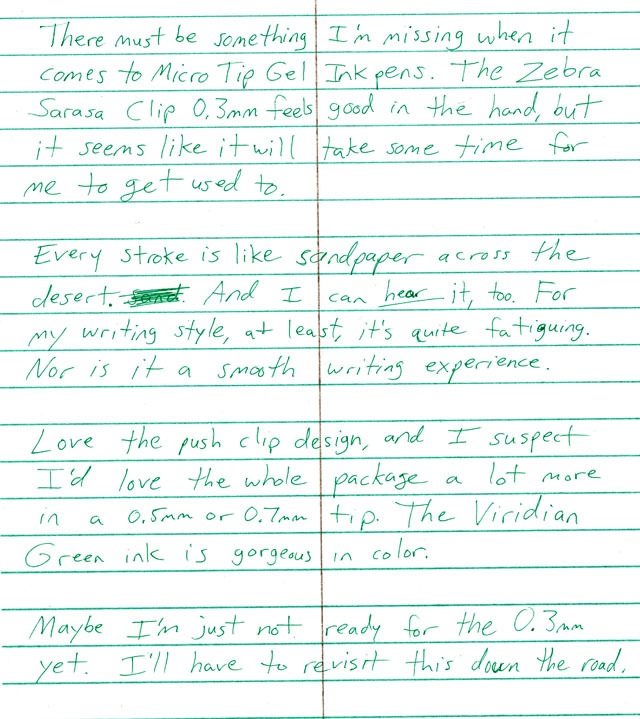 The Zebra Sarasa Clip 0.3mm feels good in the hand, but it seems like it will take some time for me to get used to. This is definitely the finest point I’ve ever used for writing, and there’s undoubtedly going to be an adjustment period. They seem to be well-loved by aficionados, so I’m being very patient and giving it a chance. Every stroke is like sandpaper across the desert. And I can hear it, too. 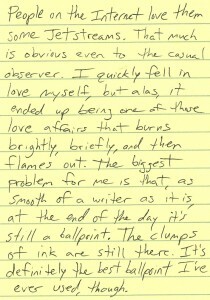 For my writing style, at least, it’s quite fatiguing. Nor is it a smooth writing experience. Perhaps this was a poor choice with which to begin my journey, but if nothing else this will give me a valuable sense of perspective as I continue to explore different options. Love the push clip design, and I suspect I’d love the whole package a lot more in a 0.5mm or 0.7mm tip. 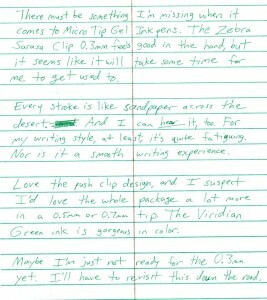 The Viridian Green ink is gorgeous in color. I don’t usually give much consideration to color when writing, but this ink’s vibrancy made me take notice. Maybe I’m just not ready for the 0.3mm yet. It’s too scratchy for my inexperienced hand. I’ll have to revisit this down the road. I’m not ready to pass final judgment, but for now, this isn’t a pen I’ll be returning to on a regular basis.